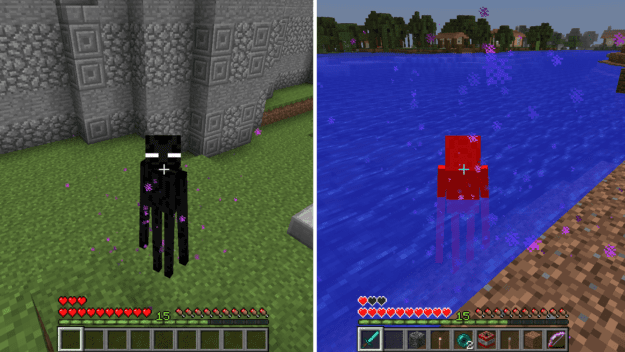 The Morph Mod allows you to take on the shape and abilities of various mobs throughout the game. Once you kill a mob you’ll absorb its “essence” and instantly become it! Each mob has special abilities that you will yield once you’ve transformed. Being a chicken, for example, will allow you to float gently to the ground instead of to your death. And swimming can be accomplished by being a squid. But with the good there is inevitably some bad effects with certain mobs. If you wanted to be a zombie or skeleton, you may be stuck to staying indoors or going out only at night. And Enderman are a bit sensitive to water. You can even morph into previous mobs that you’ve already turned in to with the easy to use GUI. That way you can keep the mobs you’d like to morph into in your back pocket whenever you need it. All you need to do is tap either the left “[” or right “]” bracket keys to cycle through your options. Then hit enter to morph. This mod does require the iChun API to be installed as well, found (here). I surely thought you would’ve mentioned that you can morph into things FROM OTHER MODS. I just really love that feature, but especially the feature that gives you more hearts depending on the mob you morph into. u know when u kill a different kind of cat in this mod it puts it on the same tab? what button is it to change to that morph? You may need to hit the bracket keys to change rather than morphing instantly. Thanks for the advice. It’s so helpful! I agree with you. And as far as morphing is concerned, you don’t have to kill the same mob again to become it. I mean,If you are an enderman and you want to become the wither boss, you don’t have to kill it again, if you have already killed it, of course! I recommend you check your controls if you have other mods. Can you turn into the Ender Dragon? Because that would be awesome! When we tried it, we just turned into pigs. 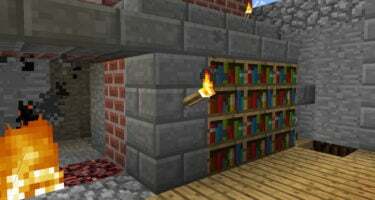 Can you teleport while being endermen? If no, please!!!! this mod looks really cool .A good way to troll your friends . how do you open the morph menu? Very cool! Morphing at Ender Dragon, will be the Strongest Player ever!!! this mod is the greatest! what is the morph key? please help! Can you morph into anything like from a nother mod? i really love this mod! why when im creeper i cant explode and mobs attacking me? wow i cant wait to try this out! I saw a video with this mod in it an had a thought. Does anyone know if you can shear a friend who is morphed into a sheep? That would be very interesting. How do I morph into another version of something? Like another color of sheep or an angry wolf? 2: Can you still use gear like human gear but with the animal’s and/paw/talon etc. I don’t think you can customize the animal. 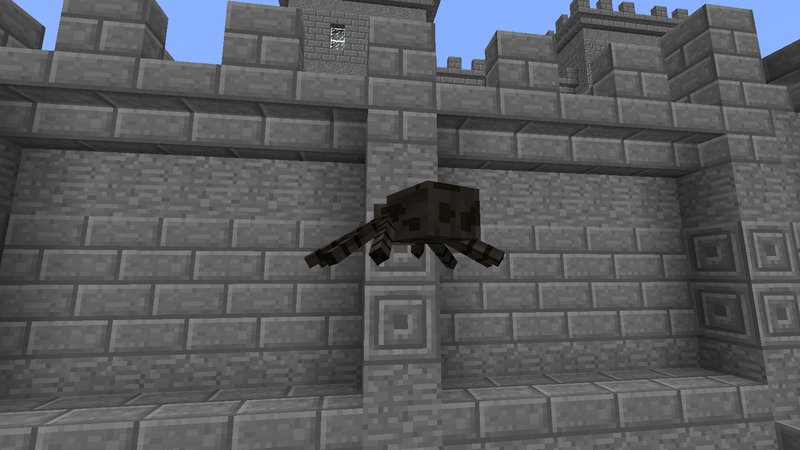 When you morph, I think the game takes away your gear so that you look like a normal minecraft animal. I’m not quite sure about your first question, though. its awesome cant wait to try it out! I have winrar, both ichunutil and morph mod, but i dont know how to be ignored by most hostile enemies, you cant config either mods in the mods menu. i tried to see what config file i might have to edit, but i have no clue what config file and line to edit. question if i kill a npc from the custom npcs mod, can i morph into it? Guys i have a problem, the special abilties doesnt work i checkd commando but nothing, help please!! I have question.. 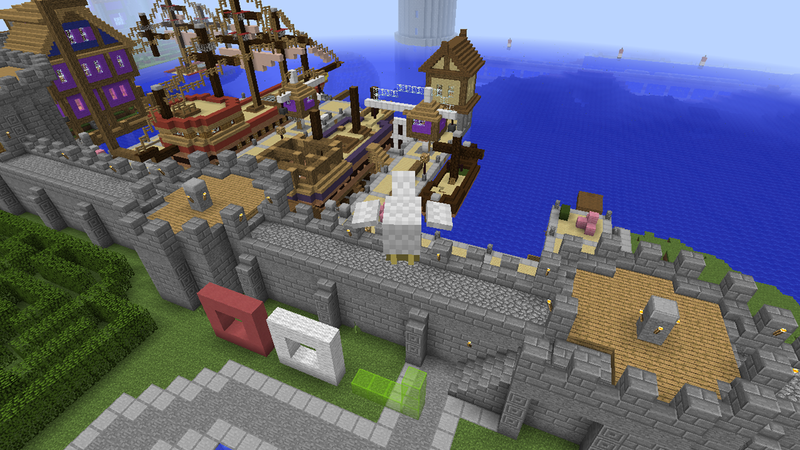 When you morph into stuff like birds do you get attacked by hostile mobs? You get attacked no matter what you are. How do you open the favorites menu in 1.7.10? Or is there no favorites menu? How do you actually use the abilities. I’ve been walking around for 20 minutes as a spider, but can’t climb a wall. 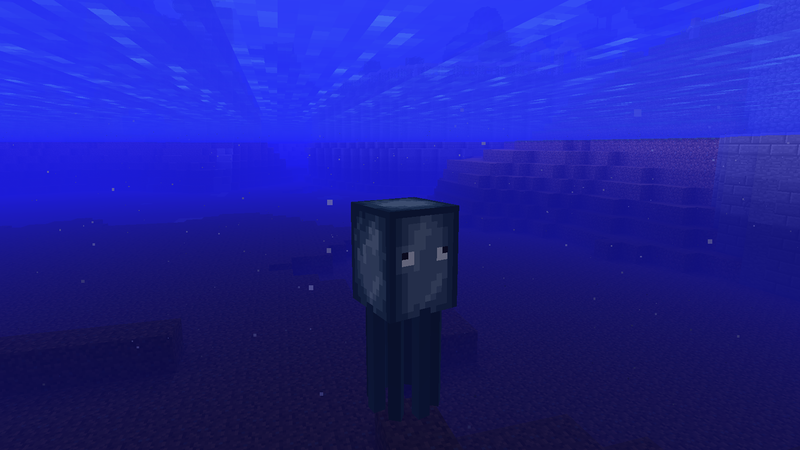 And I suffocate under water when morphed into a squid. If you are in 1.2.12, I believe that the abilities don’t work. 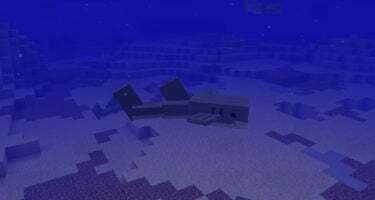 I am playing with this mod in 1.7.10, and the abilities work fine. I suggest playing on a different version. Hope this helps! 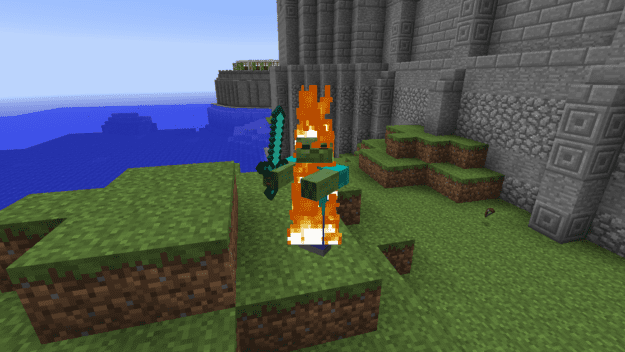 Can you morph into a mob from a mod? This mod is awesome. Get it now. Can you become the wither with this mod? Awesome mod! 😀 Only wish you could set the number of transformations in the config. Also is there a way to remove them once you have them? 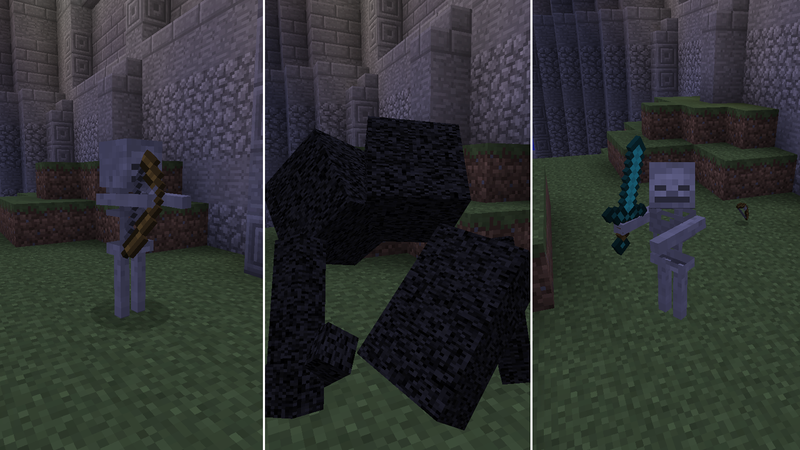 …OH btw don’t try to turn into a custom npc >.> you’ll keep moving even though your not clicking anything. Uhh I forgot to ask this lol..